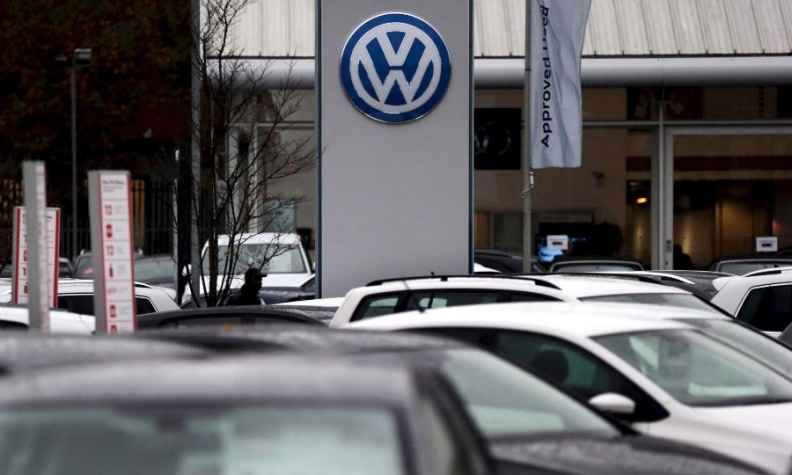 BRUSSELS/LONDON (Reuters) -- Volkswagen is unlikely to face U.S.-style fines in Europe over its emissions scandal because of a softer regulatory regime and its home country Germany's determination to protect its car industry, EU sources and legal experts say. The carmaker has been embroiled in crisis since last September, when it admitted it had cheated U.S. emissions tests using software known as "defeat devices." The U.S. Justice Department is suing the German company for up to $46 billion for allegedly violating environmental laws - though some legal experts expect the final settlement to be far lower. Other countries have also acted - Brazil and South Korea, for example, have both imposed fines of well over $10 million on VW for cheating on emissions. But although VW says 8.5 million of the 11 million vehicles world-wide that contain banned software are in Europe, no European national authority has ordered any penalties so far. EU sources and lawyers say it would be surprise if the firm received any significant fines in the European Union. While the bloc outlawed defeat devices in 2007, there are no defined penalties for using such software to mask emissions. Under U.S. law, by contrast, carmakers must identify and describe any emissions control devices, meaning they can be pursued for omission or wrongful declaration, widening the scope for punitive action. EU states are also reluctant to mete out tough financial penalties, because of an unwritten rule in the 28-member club that some national interests are sacred, according to the EU sources - and Germany's car industry has traditionally been one of them. VW, Europe's biggest motor manufacturer, employs more than 750,000 people in Germany, and has been a symbol of the nation's engineering prowess. VW, Daimler and BMW, Germany's big three German carmakers, hauled in revenues of 413 billion euros in 2014, far bigger than the German federal budget, which stood at just under 300 billion. Even if the European Commission wanted to impose penalties on VW, its powers are curbed. The EU executive can directly only impose financial sanctions on trade and competition issues. Lucas Bergkamp, a partner at law firm Hunton and Williams in Brussels, said any change to that "would be a huge step". "In general when companies are already in great difficulties due to some crisis, European governments tend to be understanding and will not necessarily seek the imposition of all possible penalties," he said, adding he could not comment on VW specifically. VW also declined to comment on anything pertaining to possible fines in Europe. Britain has said it could prosecute a vehicle manufacturer if there were proof it knew or was reckless when supplying false information, for which there is an unlimited fine on conviction. But proving recklessness is a high hurdle - it remains unclear who at Volkswagen knew what and when, while the company itself has blamed a small cadre of employees. Lawyers say a bigger financial threat to VW than any EU regulatory fines is likely to come from private litigation. Lawyers are gathering investors for group actions in Europe and hundreds of lawsuits on behalf of enraged drivers have been filed in the United States. The VW scandal has exposed the weaknesses of the regulatory system in Europe, where there is no EU-wide authority with oversight of car testing - like the U.S. Environmental Protection Agency (EPA) - but instead a patchwork of 28 national agencies with varying standards. A vehicle approved in one country can be sold across the bloc, which environmental campaigners say allows carmakers to take their pick from national regulators. However European Commission proposals, expected over the coming weeks, will add some teeth to the EU regulatory regime and penalties for excessive emissions could start to bite around the start of the next decade. Some members of the European Parliament and environment campaigners want an independent EU-wide regulator, along the lines of the EPA. European Commission spokeswoman Lucia Caudet did not entirely rule out establishing such a body, but said there were other ways to improve oversight. "All options are on the table, but greater oversight can be achieved without the need for another EU agency," she said, adding it was too soon to give detail of a proposal expected "in the coming weeks." The International Council on Clean Transportation (ICCT), which alerted the EPA to Volkswagen's use of defeat devices to trick regulators, has said mandatory, independent testing of cars once they are in use is crucial to good regulation. EU sources said the European Commission proposal was expected to ensure greater independence of the private firms that test car emissions in the bloc, which typically have worked very closely with the national regulators. The proposal, which would then face around 18 months of vetting from the European Parliament and member states before it can become law, could also hand powers to the European Commission to verify that cars on the market conform with standards and to exact clear penalties if they do not. The sources said the plan from the EU executive would be viewed as far too ambitious by some member states and not ambitious enough by members of the European Parliament. The parliament has set up an inquiry into whether the European Commission has done enough to police the car industry, but the Commission also faces counter-pressure from the industry and member states. Even at the height of the VW scandal, in October last year Germany led the dilution of separate new rules to restrict how much pollutants cars are allowed to emit above official limits, EU sources said. The sources said that Germany was supported by Britain, which is unwilling to hand extra powers to Brussels; Prime Minister David Cameron, whose party includes several Eurosceptic lawmakers, is seeking to renegotiate Britain's relationship with the EU ahead of a referendum on membership of the bloc. The difference in the tone struck by U.S. and European authorities was underlined this week; even as the United States announced its legal action, the European Commission said it was giving VW an extra month - until the end of January - to explain why carbon dioxide levels emitted by cars were higher than stated. For breach of carbon dioxide limits, there are clear penalties that so far have never needed to be enforced because EU cars - even allowing for Volkswagen's discrepancies - have as an average across the EU fleet been well below the legal limit of 130 grams per km (g/km). But the target becomes more challenging in 2021 when a 95 g/km limit takes effect and the penalty for breaking that law will be 95 euros for every gram above the limit. "When we get to the 95 gram target, things [fines] could get more interesting," said Julia Poliscanova, policy officer at campaign group Transport & Environment.